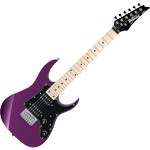 Ibanez GRGM21M Electric Guitar in Metallic Purple [GRGM21M MPL] - $149.99 : Online Music Store | The Music Store | Mesa, Arizona, All the music you can handle, delivered to your door! GRG miKro puts out sound way beyond its size. Perfect for young rockers on the way up or seasoned road warriors on the tour bus.